Hmmm. That code doesn’t seem very “MVC2ish”. First off, it’s using the old school double-quoted string to specify the property rather than the new strongly-typed lambda-based HTML helper. Secondly, it’s using the TextBox() method rather than the EditorFor() method. Third, it’s using the old <%= syntax which Microsoft is trying to get us to forget exists, rather than the new <%: HTML encoding syntax. The best approach here is for us to create our own snippets customized to our heart’s content. But the snippet files are not the easiest things to work with so rather than starting from scratch, let’s just grab the MVC textbox snippet and modify it. The snippets can be found in the directory: C:\Program Files (x86)\Microsoft ASP.NET\ASP.NET MVC 2\Visual Studio 2010\Snippets\HTML\1033\ASP.NET MVC 2. I’m going to grab the “textboxmvc.snippet” file from there, create a directory called “My MVC2 Snippets” and put it inside of the normal code snippets directory structure for Visual Studio. 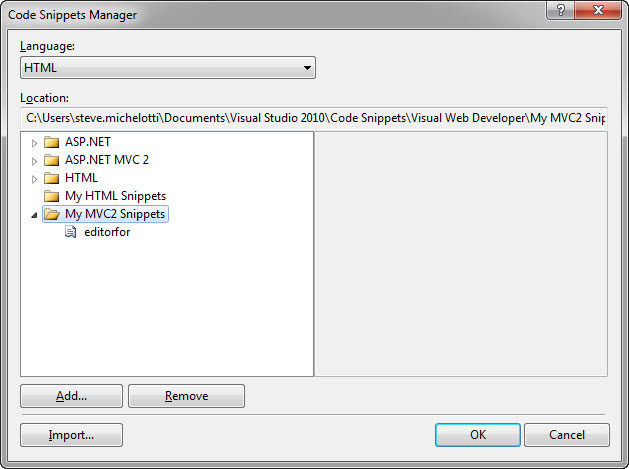 So the full path will be: <My Documents>\Visual Studio 2010\Code Snippets\Visual Web Developer\My MVC2 Snippets. Then I’ll rename “textboxmvc.snippet” to “editorfor.snippet”. Just hit <Enter> and you’re all done! Snippets are an area that you should absolutely leverage to take care of your most common mundane coding tasks and customize them per your own personal preferences/standards. Historically, my tool of choice for editing/creating snippet files is Snippy (though this doesn’t appear to actively be under development any more). I’ve also used Snippet Designer which has nice integration with Visual Studio. It appears that neither of these tools (yet) have support for the new language=”html” that is new in VS2010 (hopefully will support soon). 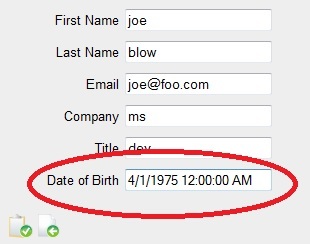 Notice how that “id” and “name” attributes were still correctly set despite that fact this this was in a partial view where we were just referring to the “Value” property of a nullable DateTime. This would have been tricky to do just using partial views with MVC 1 but here the framework is taking care of this for me. This means that the model binders will “just work” when the form is posted. Another thing to note is that I’ve added a class attribute of “datePicker” because I’m using the jQuery datepicker to give a nice little calendar UI for the end user.